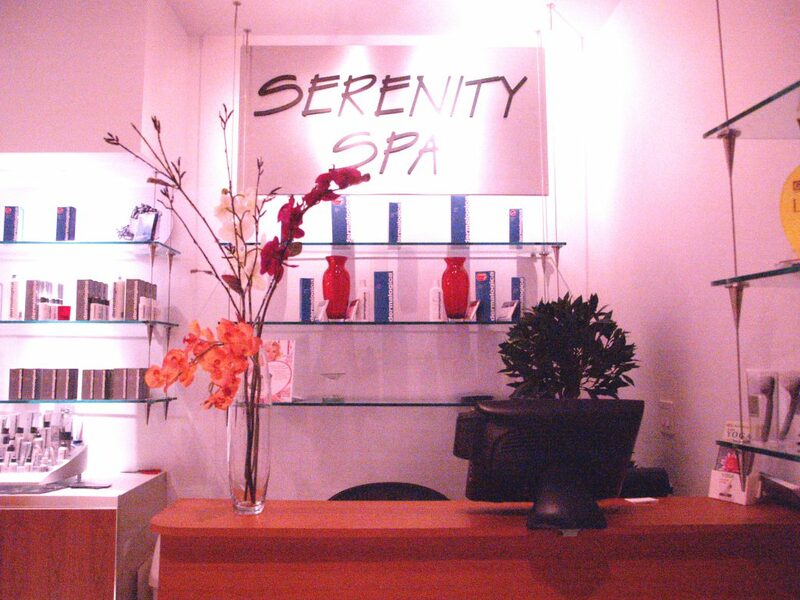 Entering Serenity Spa transforms your being into an environment of serene beauty and nature. Soothe your mind in the Zen-induced atmosphere and relaxing sounds of New Age music. 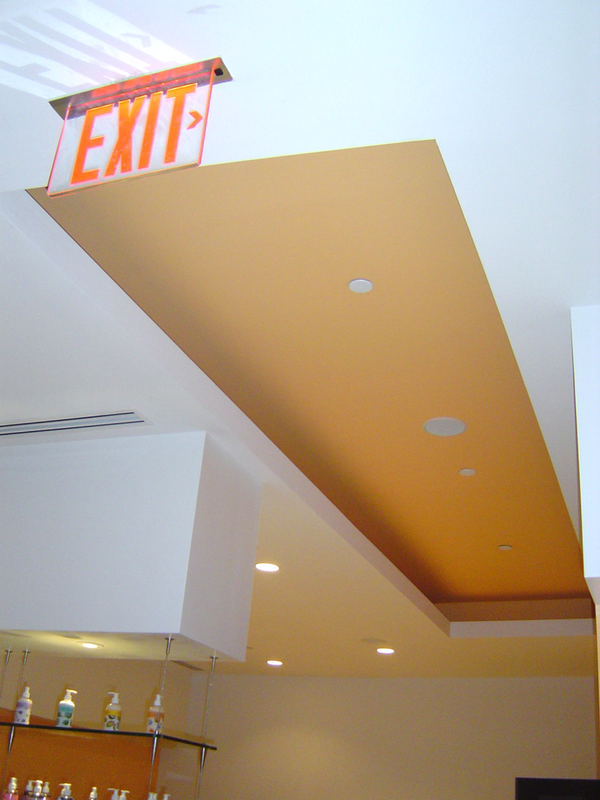 Refresh your senses as orange-peach walls, columns, and lighted ceiling cove evoke the smells and tastes of citrus. Feel nature indoors as the warm natural feel of cherry and the clean unobstructed lines and organic surfaces soothe your soul. 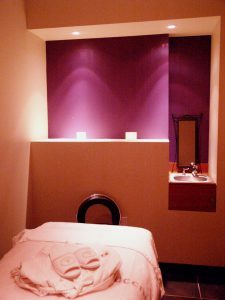 Three treatment rooms further immerse your senses; first you enter a room of light green and lavender with flickering light; the second room with candle-lit display caverns of Canyon red, peach, and alabaster; and finally entering a wet room in Desert Plateau wrapped in Tarmac black. 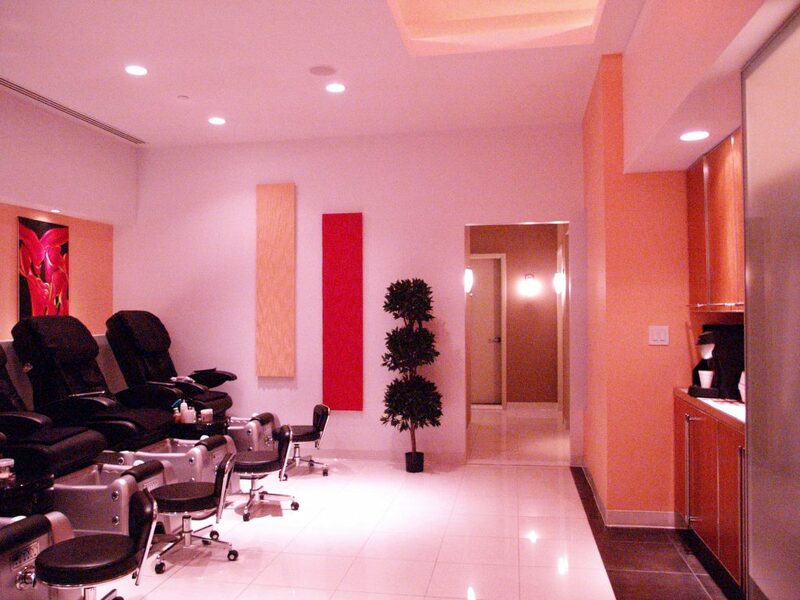 “As this day spa’s name implies, our design concept was to create an environment of serenity and cleanliness with an emphasis on nature.” Bright reds were used sparingly as accents on one hand-carved MDF wall panel and three Crimson Rose oil paintings over pedicure chairs to create bold contrast. To reinforce nature, both gouged MDF panels, one in peach, one in bright red, were hand-carved to emulate cascading water. 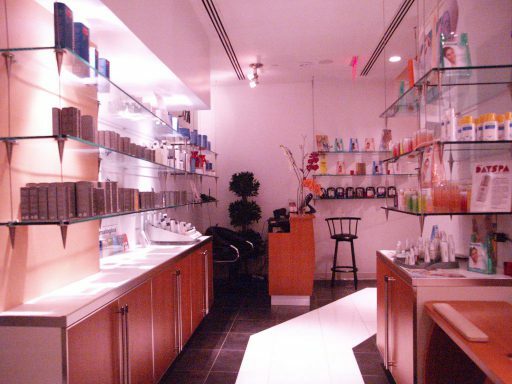 The skewed angle on the front ceiling cove face reflects the shape below of the wire suspended glass shelving display. 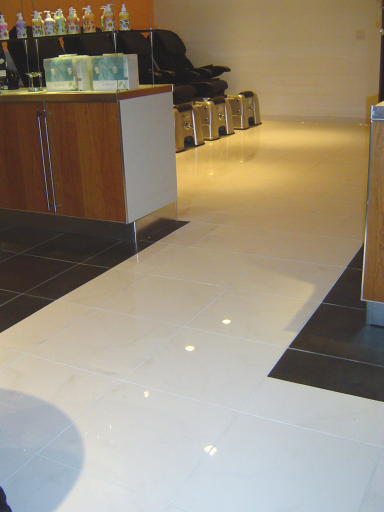 The angular juxtaposition of tarmac black and a winding white porcelain tile path beckon patrons to follow its lead through the retail area to the spa. 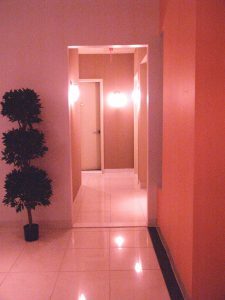 Once in the spa, you enter a dimly lit vestibule with textured suede walls. 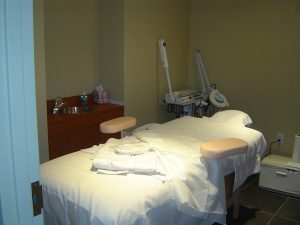 Each of the three treatment rooms has one peach massage table and cherry pedestal. 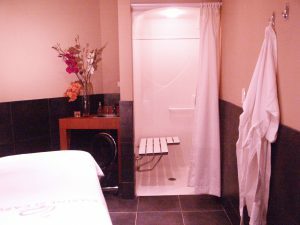 Serenity Spa is 1515 square feet in gross area. 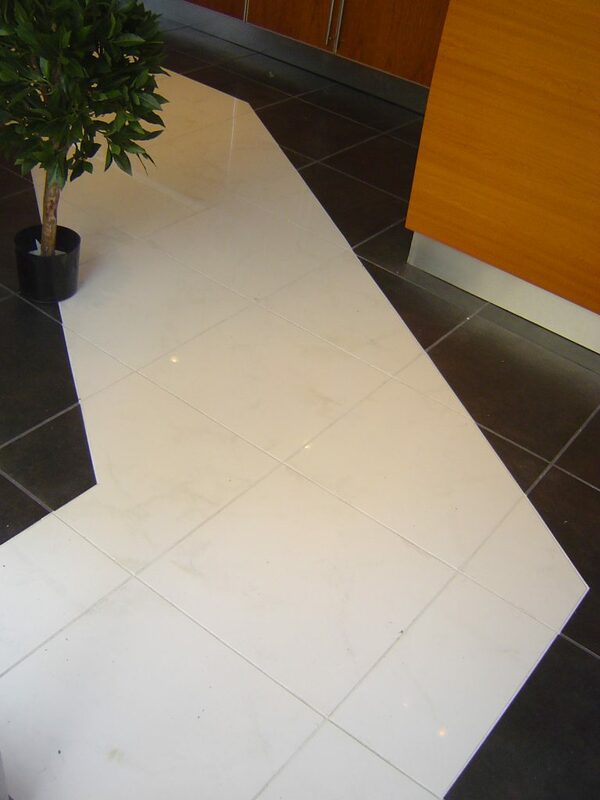 Located just north of Chelsea in Manhattan, this was new construction as this was barren ground floor retail space. All new plumbing and a new HVAC condenser water system had to be installed. 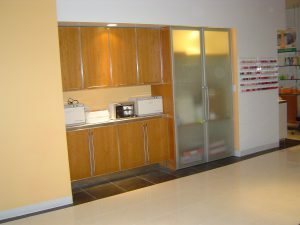 Total budget was approximately $450,000.